I have been studying about the Ulster-Scots in America, to find the roots of the settlement of this land. I heard about these people when I was younger, and being of Ulster-Scot heritage myself, (McGaughey ) I thought it would be interesting to find out more about the people who came to America in what was called The Great Migration of the 1600's and 1700's. I found that everything our great-great grandparents told us about their Ulster ancestors, has been accurately recorded in various forms. I will relate some of it here. These hardy, enthusiastic, do-it-your-self-ers; the "can-do" people who were told not to go beyond a certain boundary in America, helped form the language and culture of America. Forbidden by government to go further west, they did it anyway. Many of them went to Nova Scotia and parts of Canada during this same time period, as well as New Zealand and Australia. Among the Ulster-Scots were men like Davy Crockett and Daniel Boone. In the beginning, a large amount of them went to Pennsylvania. Many of them went to the Southern states, where their kin still live today. The Ulster-Scots wrote our Declaration of Independence, and the Constitution. George Washington said of the Ulster-Scots, "If the cause is lost elsewhere, I will take my stand among the Scots-Irish in my native Virginia." 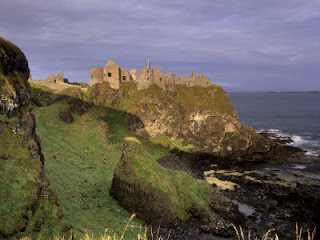 The Ulster-Scots were referred to as "Scots-Irish" in America. They came from Ulster, in Northern Ireland, having formerly come a mere 17 or so miles across the sea from Scotland, to the Ulster Plantation, which began at the same time as Jamestown, in America. These people often had no formal learning other than their knowledge of the Bible, and no particular trade, but they "took a wilderness and made a garden," both in Ulster and in America. While most Americans are familiar with the Jamestown Plantation, very few are aware of the sister-plantation in Ulster. It was said of them that they taught their children the Bible, and not to depend on others for their success; that the world would be against them. They also did not put their faith in the hierarchy of religion or government. Being self-sufficient, and teaching their children to build their houses and find a way to make a living on their own, was extremely important to them. They were able to settle in the forests, the mountains and the valleys, the plains and prairies, and on the shores of lakes and oceans. They were extremely adaptable and innovative people, who built log cabins and houses, planted crops, and took time off on the Lord's Day to worship Him and partake of the Lord's Supper. They did not seem to be dependent upon groups or approval of others to motivate them. They were extremely creative people. 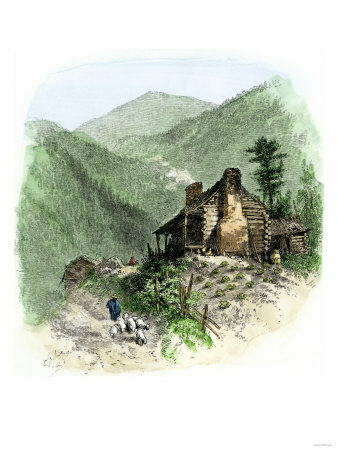 Cabin in the Blue Ridge Mountains, in the Appalachians, North Carolina, where many of the original Ulster Scot migrants settled. 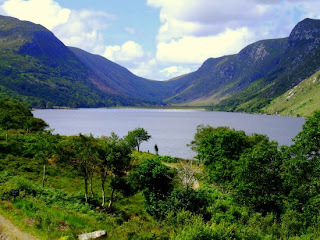 Today, the descendants of the Ulsters, or "Scots-Irish" still live in the Appalachians, and across America and Canada. Their music, accent and basic Bible beliefs, are similar to those of their ancestors of Ulster. 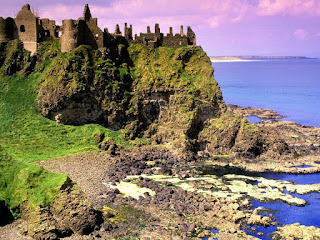 The Scots-Irish were not actually Irish, but Scots, living in the northern part of Ireland, which was given to them as a settlement by the English King James the 1st, the same James the 6th of England. (I hope I got this complicated but fascinating historical detail right!) Part of the reason for the Ulster's loyalty to England, is that so many of the kings and queens of England actually came from Scotland or had some roots in Scotland. You can read more about the fascinating history of Ulster, here. Quote by James Buchanan, 15th U.S. President, 1857-61. A very nice site explaining more about the Ulster Plantation and the Great Migration to America can be read here. The Ulster-Scots, or Scots-Irish, as they were known in America, are not to be confused with the Irish. Their ancestors lived in Northern Ireland, but kept their Scottish culture and often sent their children to Scotland to be educated. They tended to be presbyterian in religion,, which is a term from the New Testament reference to presbyters (elders, shepherds, bishops), the rulers of churches. In America, the early settlers from Ulster still relied upon the Bible for their authority in religion. When a fervent return to the church of the Bible, known as the Restoration Movement, derived somewhat from a meeting at Cain Ridge in Kentucky, the Ulster-Scot pioneers were there. It was in that place during a long gospel meeting, that many denominations decided to get rid of all denominational names and man-made creeds, and worship only according to the example and teaching of the New Testament church. These vibrant pioneers also believed that Americans needed limited government and limited interference in their lives and business. In regards to government, these settlers believed: "[W]henever any Form of Government becomes destructive [to life, liberty, and the pursuit of happiness] it is the Right of the People to alter or abolish it, and to institute such a new Government...As to them that shall seem most likely to effect their Safety and happiness....[W]hen a long train of abuses and usurpations, pursuing invariably the same Object eninces a design to reduce them under absolute Despotism, it is their right, it is their duty, to throw off such government and to provide new Guards for their future security." 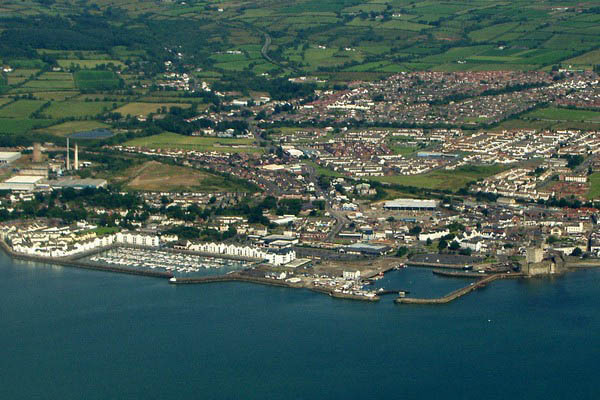 You may know about, Carrickfergus, also in Ulster, where Carrickfergus Castle is located. The Making of America: How the Scots-Irish Shaped a Nation. If you are Scots-Irish, or Ulster-Scot, you may be interested in these books, because they list the names of many of the immigrants from Ulster, and your ancestor/family name may be included. You can also go to the sites I listed and find more information on your own family. This site will help you look up your name. The sample, shows the origin of the McGee family in Ulster and America, but you can look up other names there. "Many of the Western immigrants seemed to inherit their pioneering spirit from their own fathers and mothers...they seemed to possess a spirit which rose above perils." - Thumbpapers - Sketches of Pioneer Days, by Lenore Gale Barette. These words, from the preface of "The Dangerous Book for Boys," sum up the character of the Ulster Scots who settled vast portions of this land. I have lived among their descendants, who have these same qualities. "Don't worry about genius and don't worry about not being clever," wrote Sir Frederick Thomas, on the 25th anniversary of "Boys Own Paper, September 2, 1903. "Trust rather to hard work, perseverance, and determination. The best motto for a long march is, 'Don't grumble. Plug on...be honest, be kind, be loyal. Remember that the hardest thing to acquire is the faculty of being unselfish. As a quality, it is one of the finest attributes of manliness." Ye know, and dare maintain, The Royalty of Man." Even if your relatives were not from County Antrim in Ulster, as mine were, it is highly possible that the culture these people formed has influenced you. If you like to use what you have and be creative; if you are a lifter, not a leaner, and if you like to exercise your faith, you have some of the qualities that it took to be a pioneer on the North American Continent before it became a nation. 61% of American Presidents had Scottish Ethnic Background: Jefferson, B.Harrison, Madison, McKinley, Monroe, T. Roosevelt, Taft, W. Harrison, Wilson, Polk, Harding, Taylor, Coolidge, Buchanan, Truman, A. Johnson, Grant, Nixon, Hayes, Reagan, Arthur, Carter, Cleveland. "Nothing in this world can take the place of persistence. Talent will not; nothing is more common than unsuccessful people with talent. Genius will not; unrewarded genius is almost a proverb. Education will not; the world is full of educated derelicts. Persistence and determination alone are omnipotent. The slogan "press on" has solved and always will solve the problems of the human race” - Calvin Coolidge, Ulster Scot descendent, 30th president of the United States, born 1872. Friends, please take the time to go through the links here and read a little bit about how these people affected the American and Canadian culture. I think you will find it worked for the good of our self-rule and our lack of dependence on the government for our sustenance. We need to keep this in mind and return to those principles. Alexander Campbell (1788-1866) was born in northern Ireland of Scottish stock, the son of Thomas Campbell, a minister in the Seceder Presbyterian Church of Scotland. He was educated privately by his father. In 1807 his father emigrated to western Pennsylvania in America, and in 1809 Alexander followed him. The Campbells eventually settled in a frontier area, just east of the Ohio River, in the village now known as Bethany in West Virginia. The Campbells, Stones, and other preachers were responsible for the historic old camp meeting that took place at Cain Ridge, where many people dropped all denominational names and creeds, and began to worship only as the Bible directed, calling themselves Christians only, and naming the church only after Christ. The Ulster-Scots today still celebrate the memory of the two plantations begun in the 1600's: one at Ulster and one in Jamestown. Many of them show a keen interest in America and have a deep love and respect for this country, because of their connection to the pioneers and statesmen when the country was first formed. On this 4th of July anniversary, I would like to send the Macedonian call to the Ulsters: If there are any of you that are like the ones that came in waves before, at the dawn of this nation, and if there are any of you who still understand the determination and faith of these people, our forefathers and yours, please, come over to America and help us. It was James I of England and VI of scotland. He was the son of Mary Queen of Scots who was the daughter of James the V of Scotland. Thats incredible--just a minute before I saw your post, someone told me I got it backwards--and also added it was the same James that authorized the Bible in English....I will correct the main article. Thanks for writing! 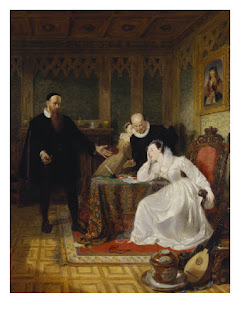 I will also add a painting of John Knox, a Ulster-Soctsman,(correct me if I am wrong) correcting Mary, Queen of Scots. She was quoted as saying, "I fear the prayers of John Knox more than an army of 10,000 men." Wow, this was great. I'll have to go back and read it again. From what I faintly recall, according to the stories I was told, growing up, Carrickfergus Castle was given to the king of Ulster but later the king of England imprisoned him there. Those who lived there before the Scots were called the "Picts" by the Roman invaders, because of the pictures they painted on their faces and bodies. 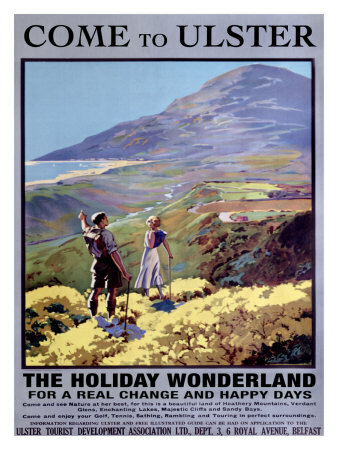 Another story I was told is that the Ulster-Scots got along very well with other immigrants, particularly the Germans and Dutch in America, because they all tended to mind their own business. Fascinating and motivational post! Thank you. I work on the oldest farm in America still owned by the same family since 1632.We are always interested to hear the story of other families that ventured into this great land at the same time.With so many links I feel I will return to this post more than once. We are Scottish Highlanders (were born in, and still live in, the Outer Hebrides). So many of 'our' people are now 'your' people, and we always speak of that to our children: what these hard-working, self-sufficient, God-honouring, people would think were they to see their descendants today - both in the US and here, in Scotland. I could go on. I loved your post. I love the Scots-Irish history. I wish we could see much of it again. And if you're ever in the position to call more of us over to your wonderful country, I can assure you, we'd be there in a flash! I understand this renewed interest in the Ulster-Scots and Scots in America has come from some kind of anniversary celebration of the two plantations. What do you know about this. 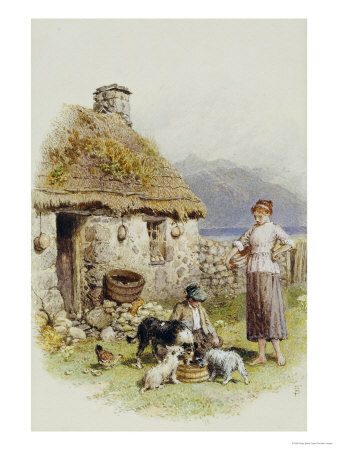 Regarding homeschooling: the Scots that pioneered America did not cluster together with other Scots but spread out and were perfectly content to be independent families. They all taught their own children, started their own congregations, and were always willing to fight for their independence. There is another book out now called "Born to Fight", and a film called "The Dawn of the Ulster-Scots. "I have not finished reading all of the books and sites I found, but it is so interesting that EVERY detail that my parents grandparents related to them is accurately recorded, even though we only knew it from word of mouth in the past. they shrunk at letting anyone help them because they were very independent and felt ashamed if they ever asked for anything. If they had nothing, never would they beg or feel entitled. They just accepted it as the Lord's will in their journey on this earth and they learned from it. In fact, today, many of these people would rather make things themselves than buy everything manufactured. Never would they complain about their lot in life==it would have made them appear to be spineless failures. Fathers were the head of the home and they established policy for the family, and they insisted that the family not reveal anything personal to outsiders. They simply did not believe in airing their dirty laundry to the public. And never did they want anyone to feel sorry for them. Poverty didnt frighten them. Hard work didnt daunt them. Invention delighted them. Creativity and work was PLAY to them, and making things do, and stretching their money or doing without, was almost a form of amusement to them. 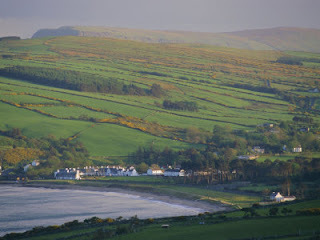 Ulster-Scots, or Scots Irish as they were called in America, thrived on hard work, and to this day, many of them would rather stay home on a holiday and catch up on unfinished work--but to them, it is not work, it is something that gives them energy. I entertain myself by figuring out how things are put together and how I can make something from what others might consider trash. Luxurious living to the Ulster-Scots that brought up large families (including mine) was a tin can with a bouquet of wild flowers, on the hand built table, and eating freshly caught salmon with vegetables from the garden. That was progress, that was high living.The children were taught all kinds of frugal and inventive crafts and play. If they had failures in life, they didnt blame anyone. Growing up in a large family, we were taught not to blame one another. We learned how to re-build our lives from any resources we had, even if there was very little. THese kind of people could survive, and thrive, because they trusted in God and His work ethic, and were not dependent on the government to help them. While they disliked to ask for help, they were always ready to help someone else build their house or house people after a disaster or a fire. 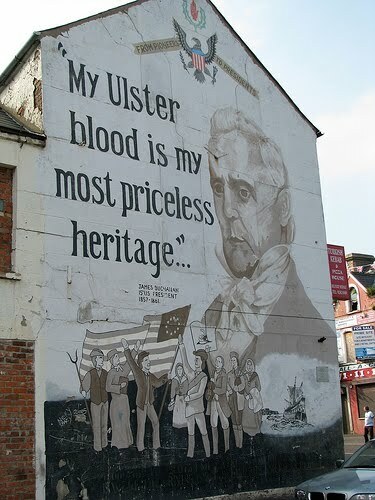 The Southerners in America carry on the Ulster tradition in a large way, as many of them have kept up with their geneologies dating back to Pennsylvania where the first wave of them settled. Thanks for this post. I remember my grandpa telling us on St Patrick's day that we were orange Irish, not green Irish, and I never knew what he meant. Our family name is Carney, with McGee and Ferguson as other names. My ancestors (women too! )have been in California since well before the gold rush. This helped to fill in some holes for me. Joy, My parents grandparents told them they were from County Antrim and that they were not Irish. This was handed down through several generations and finally is coming out in history books. Being more orange than green is another thing that your ancestors handed down and is now verified by recent research. The Ulsters contributed a lot to the American culture, and some researchers have said that their culture formed the American culture of hard work and innovation, do-it yourself, and independence. For anyone who is interested, the tricolour flag of the Republic of Ireland represents the green of the Catholics, the Orange of the Protestants and the white symbolizes the wish for peace between the two communities. I'm Irish (Republic of Ireland) Catholic but would you believe I'm descended from English puritans who came over with Cromwell in the 1600s. There were two branches of my family in Ireland for about two hundred and fifty years, as one branch converted to Catholicism. My ancestor came from a family of mixed Puritans and High Church. His father was a Puritan divine and author of several anti-Catholic works but his brother was the Archbishop of York - who along with Archbishop of Canterbury was the head of the Church of England. Eventually the Protestant ones all emigrated from Ireland to the good old USA! As indeed did a number of the Catholic ones. One of these was ended up in New York where she set up a beauty salon on Fifth Avenue. She traded under her married name of Elizabeth Hubbard and began producing a range of cosmetics known as Hubbard's Grecian Creams. Her business partner and she did not get along and the partnership ended acrimoniously. Partner took over the salon and kept the name Elizabeth which she combined with Arden....... Yes, I speak the truth. Family history is truly fascinating. As an Irish person I can confirm that we in the Republic would definitely not consider the Ulster Scots as 'Irish'. 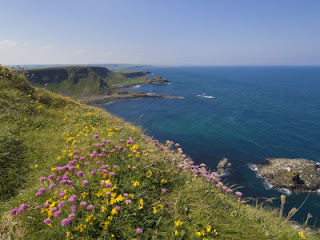 We refer to everyone over the border as Northern Irish, including those of Gaelic as opposed to Scots ancestry. If we're talking about the Ulster Scots in everyday conversation we refer to them as 'the Protestants' or 'the Unionists' referring to their wish to remain part of the United Kingdom. At one time the whole of Ireland was ruled by the Ulster family of O'Neill. 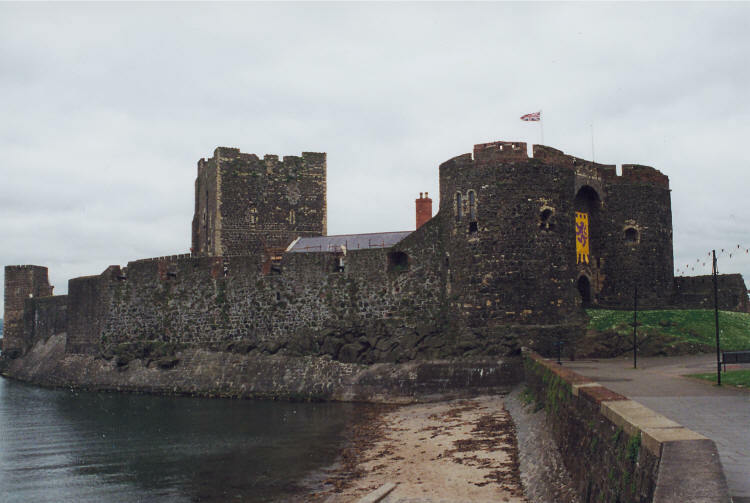 Long before any British presence on this island we had a High King and several lesser Kings. 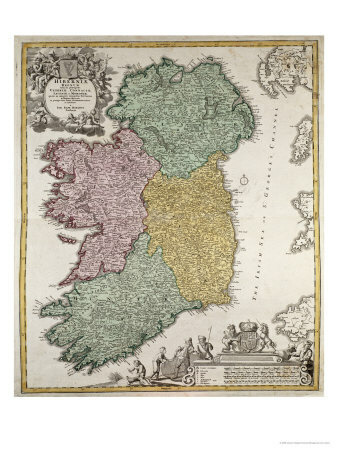 The O'Neills were the ruling family of Ireland for more than 500 years and their seat was at Tara. So because the province of Ulster was the seat of the High King of Ireland for such a long time, one can understand the sensitivity of Ulster now being a part of the United Kingdom. Anyway best wishes to everyone. Well Lydia I don't mind a bit about the cosmetics - I'm sure Elizabeth Arden was far superior to Hubbard's Grecian Creams and fully deserved her success! 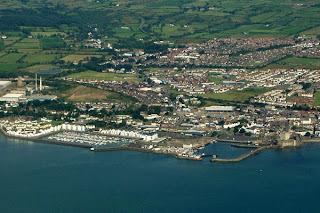 As for the history, well I must say that although there is still very little love lost between the Ulster planters and the native Irish, I was always told by my mother that the Northen Protestants as she called them, had a very strong work ethic and those who could put aside their political views would acknowledge this. Also they had very fine craftsmen and stone masons who created some beautiful buildings in Northern Ireland. The influence of their architecture can be seen over the border in the Irish Republic in the border counties of Cavan, Monaghan and Donegal. They built some lovely churches, schools and dwelling houses in a very distinctive style with a definite Scottish influence. Simplicity of design and quality of workship are the main features of the buildings they constructed for their own personal use. They also worked on many important public buildings. Yes the combined history of the various parts of the British Isles is very complex indeed because it goes back so far and involves four separate countries. The first recorded history of England begins in the fifth century with the Anglo-Saxon chronicles - that's an incredible 1,500 years ago! And we know for a fact that St Patrick brought Christianity to Ireland at the same time. It's amazing to think that there were still pagans in Europe as long as 500 years after that. The definition of Christianity would be where I would differ from the officially printed history, for I believe that in its true primitive form, close to the New Testament pattern, it always existed in the British Isles. I have an old photograph of a meeting place where Christians met for worship on the first day of the week, who called themselves Christians only and who followed the pattern of worship found in the New Testament. So wherever the word of God has gone, via the scriptures, people patterned their beliefs after it and established little congregations of believers. Though it was not as huge as the Catholic church, it did always exist, and the Bible promises that it always would and would never be destroyed. Small pockets of believers have always been everywhere and not everyone was pagan, even though it was not recorded in hisoty. For example, you and I may never be recorded in any official history, but we did exist. Just because something does not make the news, does not mean it did not happen. There were always believers who followed the simple teachings of Christ, and there were "approved" religions that made a big bang in history. The little family taking time out to observe the Lord's Supper on the first day of the week in their own home or in a village meeting house, may not have captured the notice of anyone, but they did exist. When I get time, I will post a picture of the meeting house I mentioned that existed during the ancient history of Britain. Yes Lydia of course you're right. Long before an established church there must have been small pockets of believers. I'm aware that in the remains of Roman Britain they have found houses with the words Pater Noster 'our Father'carved into the lintels above the doors indicating that they were Christian. Christians and pagans must have lived alongside each other for many centuries. What I really meant to say was that it's extraordinary to think that there were still so many pagans 500 years after Christ. There are many scholars who believe that Joseph of Arimathea crossed to England shortly after the crucifiction and evangelised there. 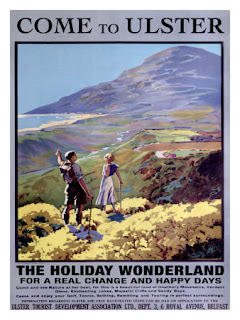 They think he disembarked near Glastonbury which may be the ancient site you refer to. And yes, scholars also agree that the early Christian rites of worship were very different to the later Latinised version. Best wishes. well my family was mixed episcopal/roman,and calvinist. the cultural differences between the religious groups are very strong,chiefly,my episcopal ancestors ere well to do,conservative,and better educated,my presbyterian ancestors hard working but very prejudice and not forgiving,my catholic ancestors,stayed away from both groups,and kept mainly to themselves,so how do i identify myself,Anglo-Irish,mainly english had the task,as we come from roxbrugh,on the border with England,and with a Danish mix thrown inFlegg surname,note it was the landed Scots and English who had the means to settle the escheated counties of the north,not the covenenters,we English settlers from Ulster are also of the heritage,just ask those who paid the hated tithes and test sacrement,that was a chief reason they left ulster.regards,MTKearny.